A look at bewildering behavioral patterns of the English. 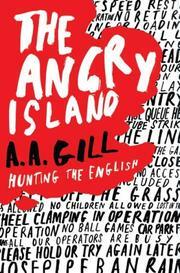 Though he’s a critic for the London Sunday Times as well as a travel writer (A.A. Gill is Away, 2005), the London-based author is Scottish, a fact he mentions as often as possible in an attempt to separate himself from the peculiar creatures he writes about. Chapter headings like “Class,” “Sport,” “Gardens” and “Queues” give some idea of matters covered in this “collection of prejudice,” as Gill points out evidence of “anger…the thing that seems impermeably English.” The book, a series of comical vignettes, provides many hilarious examples of inexplicable angry outbursts from the English, and while the logic behind these eruptions may sometimes be baffling, in Gill’s hands they’re uproariously funny. One encounter with an English couple he met while on vacation got off to a bad start when the author, thinking they were annoyed to no longer be the only Brits staying in their hotel, immediately apologized to them for his presence. The baffled couple couldn’t figure out why he was apologizing, and the comedy of errors that ensued ultimately led to Gill apologizing for his apology—he claims there’s nothing the English like less than being apologized to for no apparent reason. Make a note.